Welcome to the month of April! 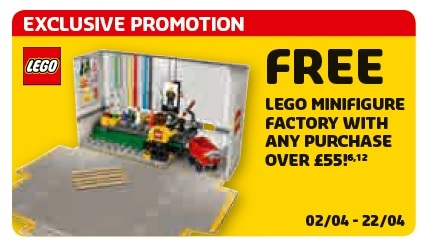 From April 1-15, you can get a free exclusive LEGO Minifigure Factory set with purchases of $75 or more at LEGO Brand Retail Stores and LEGO Shop at Home (US | Canada). The LEGO Minifigure Factory set contains 86 pieces and include 1 regular sized minifigure. It also include 5 micro LEGO minifigures as well! Later this month from April 13 to May 3, you can get a free LEGO Darth Vader Pod with LEGO Star Wars Purchases of $60 or more. There’s also some new LEGO items which you can check out here: US | Canada | UK. You can check out the full April 2018 LEGO Brand Retail Store Calendar here. *For those living in Great Britain and Northern Ireland (United Kingdom), the free LEGO Minifigure Factory runs from April 2-22. Spend £55 or more and you can get the set for free.